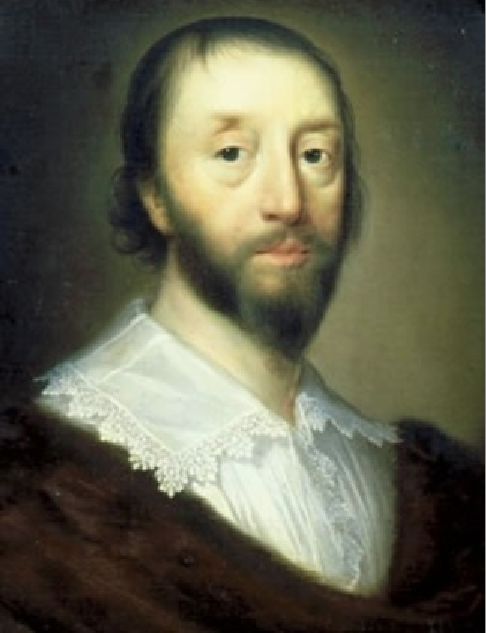 To add balance to the last post, Sir Alan was a royalist who took no active part in the wars but later was one of the Sealed Knot group of conspirators working to restore the monarchy in the late 1650s. The picture was painted in the 1640s by Robert Walker and is now in the Wandsworth Museum. Unlike the warlike Sir Arthur Hesilrige his falling band is not tied away with ribbon and he sports some decorative bandstrings and although his armour is just as impressive, I suspect it saw no action. 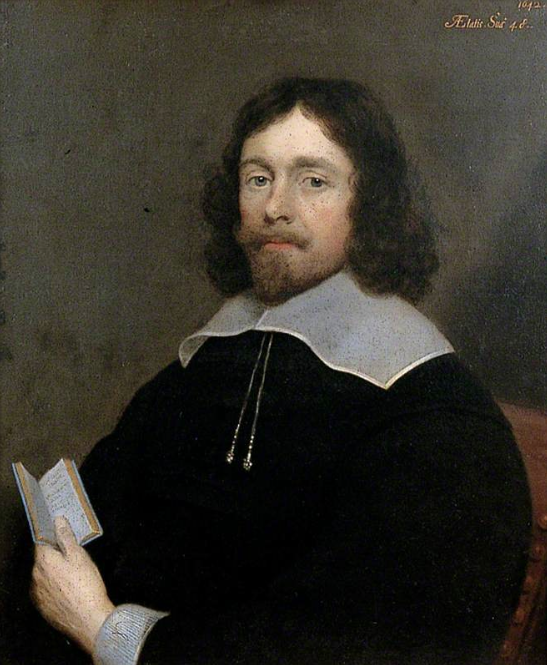 Painted by an unknown artist in 1640, Sir Arthur was one of the parliamentary movers and shakers before, during and after the war. 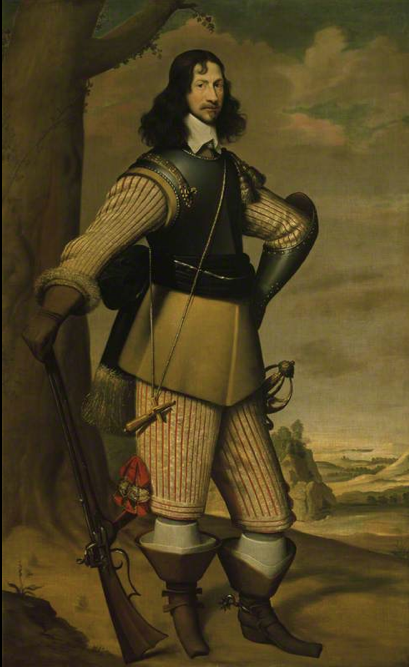 He was one of the five members that Charles tried to arrest from the House of Commons in 1642, fought in the war, raising a troop of horse equipped with three quarter armour known popularly as his lobsters. He was also prominent on the political scene during the interregnum. He is portrayed in front of a backcloth in very shiny full armour and presumably a wide falling band tied with a black ribbon. This picture is in the National Portrait Gallery. Written by Robert Crofts to please himself. Published in 1638 in London. Sadly the book isn’t as saucy as the title may suggest but is a manual about getting on with your wife. 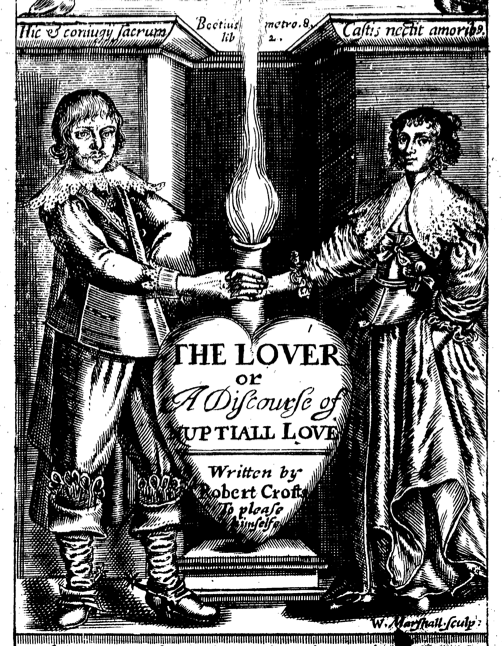 The front cover features a William Marshall engraving of a high status couple, who presumably are happily married having followed the advice contained within. The man is dressed in a well-cut doublet and breeches with wide laced falling band, matching cuffs with a pair of soft boots and spurs. The wife in beribboned bodice and petticoat with a cutwork kerchief that doesn’t quite hide a glimpse of cleavage. Catchy title, I know, but this is a lovely portrait painted by John Souch in 1640 that hangs in the Grosvenor Museum in Chester. So touching that they are holding hands, but sad that we don’t know who they are after 350 years. The lady is wearing a real confection of linen around her neck. I’m not sure exactly how it is constructed, or even how to describe it but it is made of very fine see-through linen, accentuated by the large straight hems that frame the pieces and matched by the double cuffs of the same fine linen. She has a smart black petticoat which is parted down the centre to reveal a green under-petticoat with silver decoration. 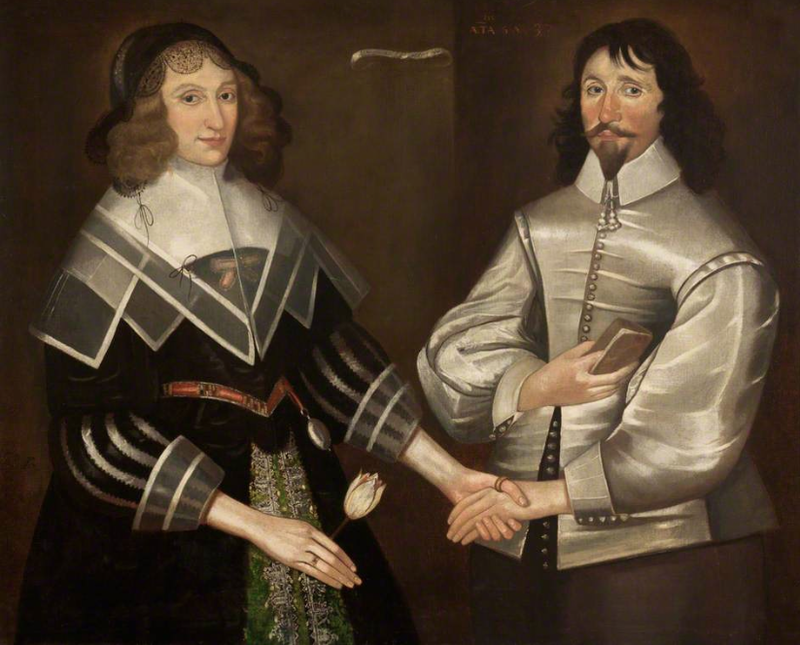 She is also holding a white tulip which matches her husband’s silk doublet. Strangely the artist has left the strain lines that indicate he’s put on weight since the doublet was first fitted! Interesting that the breeches don’t match his doublet but the fly buttons do. Painted again by Cornelius Johnson sometime before he died in 1639, Sir Dudley was a well travelled diplomat, courtier and member of Parliament. He was also heavily involved in overseas trade and was a “Virginia Adventurer”, investing money in the Virginia Company of London. What I like about this portrait is the detail of his shirt, which has a falling band seemingly directly attached directly to the body of the shirt and the bobbin lace runs all around the collar and extends down the neck opening. This kind of decoration would not be seen when worn under a doublet, but was presumably designed for when the shirt was worn as shown, indoors under a loose coat or fur wrap as seen here. Definitely a high status shirt! Painted in 1642 by Cornelis Janssens van Ceulen, better known in this country as Cornelius Johnson. 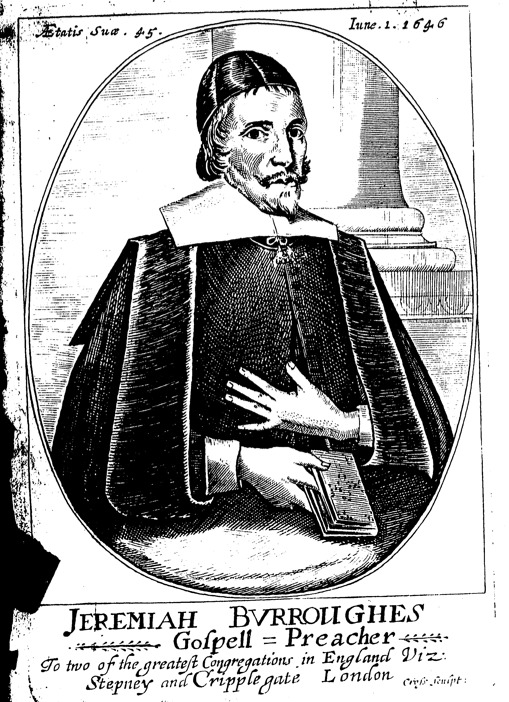 Sir William was a prominent Kent royalist who was arrested and imprisoned in London virtually at the start of the war and only released in 1645. He played a part in the second civil war of 1648 when he led a staunch resistance of Maidstone against Thomas Fairfax. This portrait shows him in somber tones in a smart black doublet and a neat falling band of fine linen and understated band strings. This picture hangs in the Maidstone Museum & Bentlif Art Gallery. Delivered in a Speech to his Excellency the Lord Gen. Fairfax,on Friday last at White-Hall, by Mr Everard, a late Member of the Army, and his Prophesie in reference thereunto; shewing what will befall the Nobility and Gentry of this Nation, by their submitting to community. Anyway, the guys in the woodcut on the front page are dressed for cold weather, on the left in a dutch coat with large cuffs and on the right foreground in a collared, sleeveless cloak. Notice his falling band is pulled out so you can see it over the cloak. Both wear tall crowned hats and doublets. The woman in the rear looks to be wearing a petticoat and possibly an open gown over the top, though the quality of the woodcut makes it tricky to see any details clearly. or a New Dispensatory Contayning 70 approved Physical rare Receits. Most necessary and needfull for all sorts of people to have in their Families. 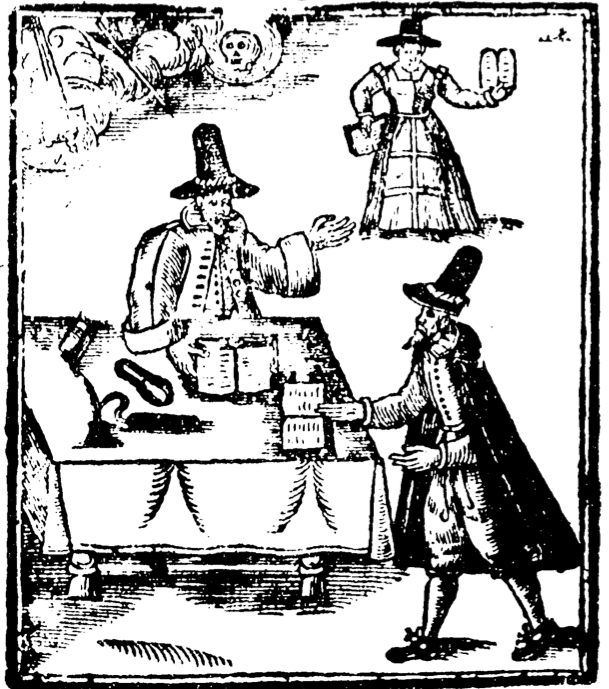 Written by Salvator Winter and published in London in October 1649. It’s one of those books that claim to cure all ills and stop your hair falling out or going grey with a few pinches of pepper and a handful of herbs from the garden. It’s highly recommended! 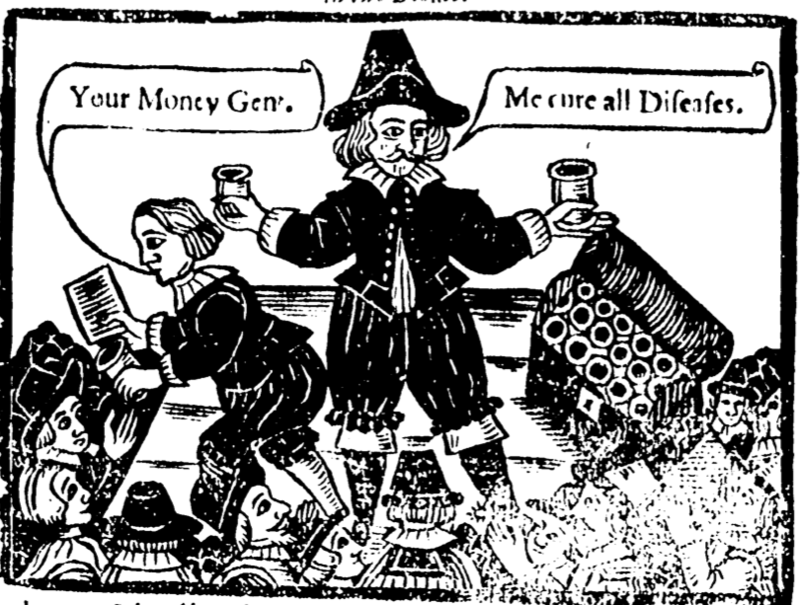 I particularly like A Medicine for the Squinsie: “Take the ashes of Centory, and the powder of white Dogs-turd, make it into a Plaister with Honey, spread it upon a cloth and lay it upon the griefe”. Nice. Anyway, on the front cover appear a quack doctor and his assistant, presumably selling the concoctions described within. They are both dressed smartly in late 1640s short doublets and unconfined breeches. The Doc has his doublet open from halfway down so we can see the folds of his shirt and a tall-crowned felt hat, whilst his boy is bareheaded, showing his cropped hair, possibly marking him out as an apprentice.